With the Facebook & Cambridge Analytica scandal keeping security practitioners and their lawyers up at night, and rightly so, it is very likely there is second guessing going on over the digital transformation happening in organizations. Across all functions — marketing, sales, LOBs, support — the “go digital, go cognitive, go AI at all costs” mantra is being questioned. In this week’s webinar, Ashwin Krishnan delves into the ethics of today’s technologies. 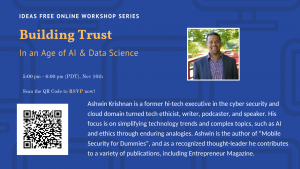 Ashwin is a former hi-tech executive in the cyber security and cloud domain turned tech ethicist, writer, podcaster, and speaker. His focus is on simplifying technology trends and complex topics, such as AI and ethics through enduring analogies which he shares on his blog. Ashwin is the author of “Mobile Security for Dummies”, and as a recognized thought-leader he contributes to a variety of publications. The presentation begins by discussing why this is a big issue today. Why are we now starting to pay attention to how tech affects our privacy and information? Some reasons are the plummeting costs of storage, and the widespread existence of software in every aspect of life. Luckily, as a result of the increased risk that technology poses to our privacy, our awareness to our vulnerabilities is also increasing. This is in part due to activism, exposés, and improvements in security software. Ashwin then turns the attention to businesses, their common practices, and what they can do to ensure the ethical treatment of user data. He begins with an example of him trying to stream a football game on AT&T U-Verse, and being asked to share information like his call history and photo library to the streaming platform. Why did they need this information? It turns out they didn’t, but many users will click through without a second thought and share this data anyways. Luckily, businesses are starting to take notice, innovate, and make change to support tech ethics. Also, advances in technology and data regulations are adding to this trend. Regulations like GDPR, CACPA, and Senate Bill 237 are working to give the user more ownership and control over their data. The webinar closes with a summary of a proper ethical framework for businesses regarding data. There are four principles businesses must take into account and ask the appropriate questions for each. The first principle is data weaponization. How much data is collected, what insights are arrived, and how is the company taking advantage of their relationship with the user? Next is transparency- are the terms and conditions reasonable? Is there an opt out option? Data sharing is next. Companies must be mindful of who they share user data with and what the 3rd party is doing with it. Last is user control. It is important that the user can choose what and how much data they share. Overall companies are getting better at this due to a number of factors, but Ashwin emphasizes diligence on our part to make sure we are in control of our information in the age of big data. See the webinar at the attached link for the specifics and details on how you can make sure of this. According to a report by the McKinsey Global Institute, the United States alone could face a shortage of 1.5 million managers and analysts with the knowledge of how to use the analysis of big data to make effective decisions by 2018. A business analyst is an expert who has the skills and knowledge in both business analytics and data sciences, and understands the business needs and IT resources. Successful business analysts have multiple roles, such as to be clear communicators, smooth facilitators, precise analyzers, and team players. Also, the ideal analyst has the versatility of various business functions, such as operations, finance, engineering, technology or architecture. In the SoCal Conference 2018, we are honored to invite many professional speakers with a background in data science. In particular, these speakers provide a rare opportunity to recommend jobs. 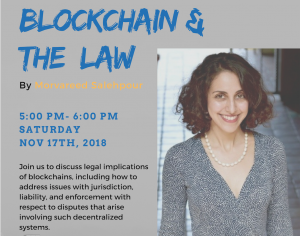 Come to join our Southern California Conference 2018, and meet up with our speakers. Subscribe to our latest newsletter.